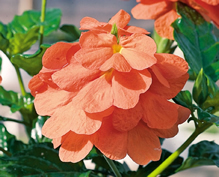 Crossandra flowers are very popular for their bright colour, light-weight and keeping quality. Deep orange coloured flowers are of great demand for garlands and hair adornments. 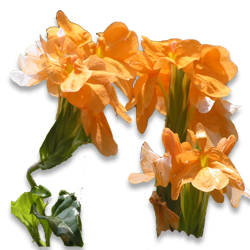 Yellow Orange, Lutea Yellow and Delhi (triploid) are the important varieties. 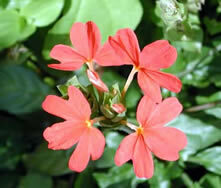 Crossandra could be cultivated in a wide range of soils. Fertile, red loamy soils with pH range of 6 to 7.5 are ideal for its cultivation. Propagation is by seeds or stem cuttings. Seedlings are ready for transplanting when they have four or five pairs of leaves. In the case of triploid varieties like Delhi, cuttings are used. Cuttings should be transplanted when sufficient roots are developed. The land has to be ploughed three or four times. FYM @ 25 t/ha is incorporated and mixed well in the soil. Ridges are prepared 60 cm apart. A fertilizer dose of 33.3: 60: 60 kg/ha N:P2O5:K2O is applied as basal. The seedlings or cuttings are transplanted at a spacing of 30 cm. The crop is topdressed twice with 33.3 kg N per ha each time, the first at 3 months after transplanting and the second 8-9 months after transplanting. 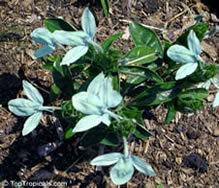 The application of fertilizers is to be necessarily followed by irrigation. Weeding, application of fertilizer and earthing up are combined together for easy maintenance of the crop. Scales, plant bugs and white flies are the important insect pests, which can be controlled by phosalone (0.07%). Wilt caused by Fusarium solani will result in yellowing of leaves and death of the plants. The incidence of the disease is found to be more in the presence of root lesion nematode. 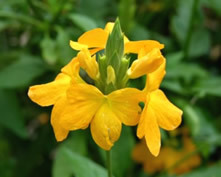 Crossandra flowers within two to three months after planting and continues to bear flowers throughout the year with a lean production season during rainy months. Flowers are to be picked early in the morning by pulling the corolla out of the calyx. Harvesting of flowers is to be done on alternate days. The yield of flowers is about 5 t/ha.